Stale bread tossed with turkey pastrami, ripe tomatoes, peppers, cucumbers, red onion, fresh mozzarella and a champagne vinaigrette makes for a delicious picnic lunch!!! In my efforts to keep things a little healthier around here, I wanted to share with you one of my favorite salads, Turkey Pastrami Panzanella. I love this Tuscan salad mainly because the stale or crusty bread gets to sop up all of that delicious vinaigrette dressing. I’ve even found myself fishing through just to find those yummy homemade croutons. 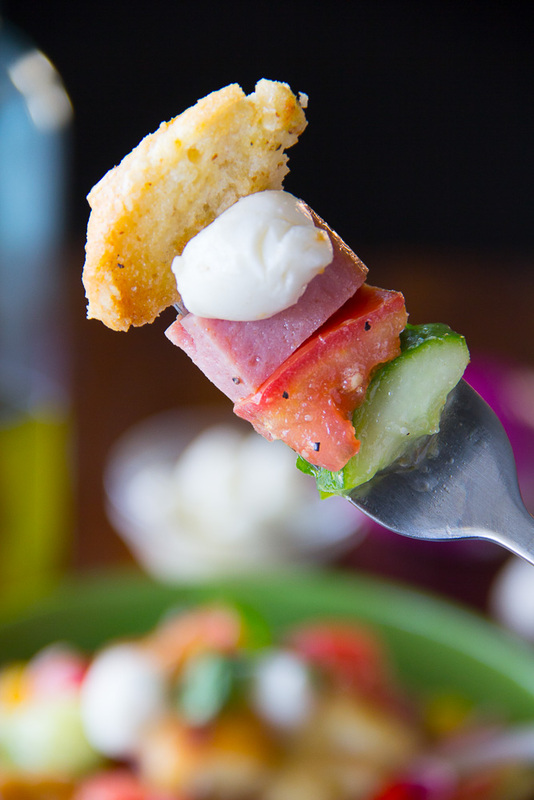 Did you know that homemade croutons are simply THE BEST!!! Not too hard where you feel as if you may break a tooth but crunchy enough to belong in any yummy salad. Plus you can season them anyway you like!!! 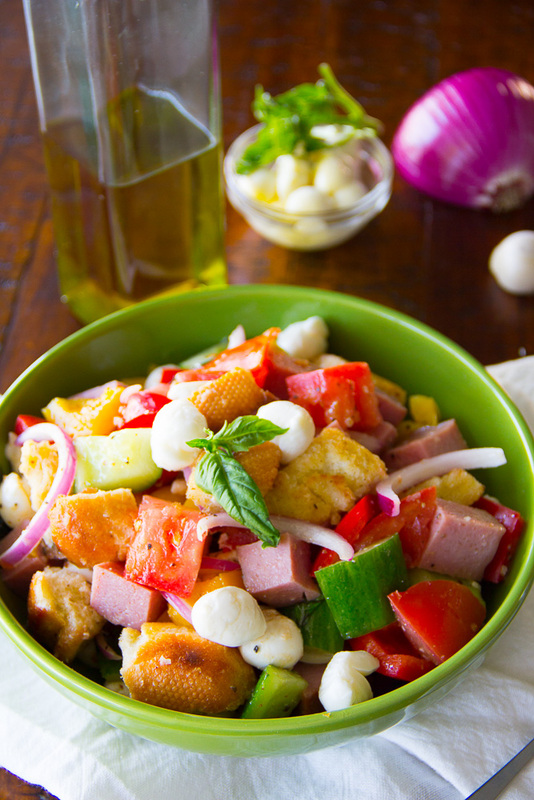 Hubby and I have enjoyed this bread salad at romantic picnics or even for a quick lunch with friends. 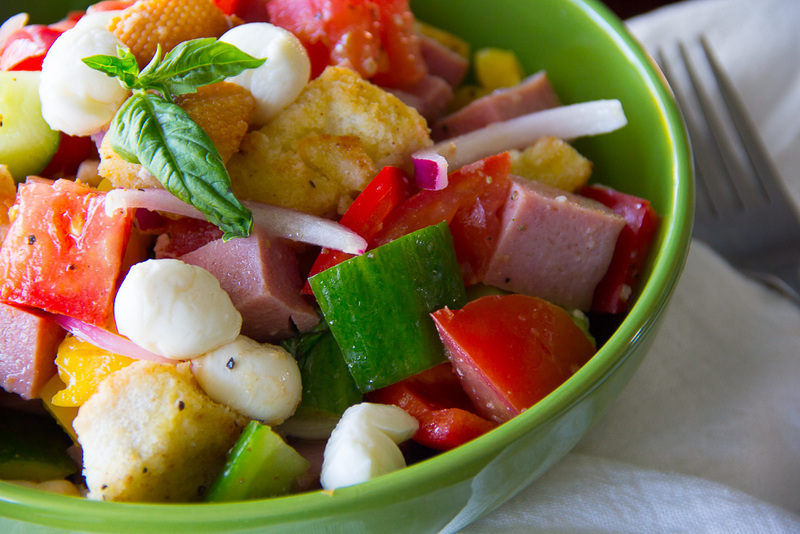 I’ve added the turkey pastrami and mozzarella to make this particular panzanella more of a substantial meal but they’re not original to the dish. The best part is that you can customize it to make it your own. I’ve seen this salad done with capers, boiled eggs, carrots and celery as well but these additions may disappoint some traditionalists. Heat the oil in a large saute pan. Add the cubed bread and salt. 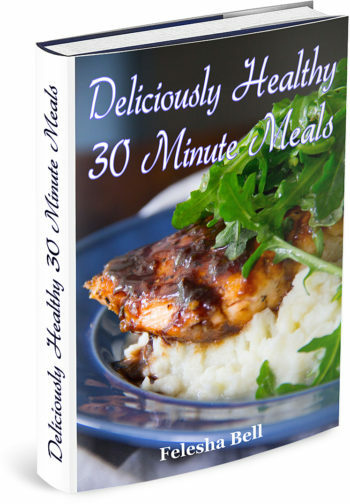 Toss frequently over medium heat until toasted and browned. Add more oil if needed. 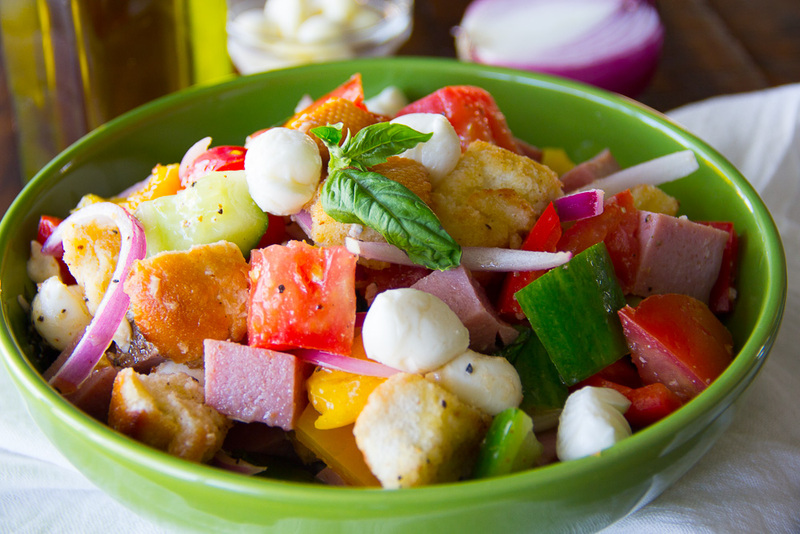 In a large bowl, combine the tomatoes, red pepper, yellow pepper, cucumber, red onion, basil, turkey pastrami and mozzarella. Add the croutons. In a small bowl, whisk the garlic, Dijon, Champagne vinegar until combine. Slowly stream in the olive oil and continue to whisk quickly. Pour the vinaigrette over the salad and combine. Season with salt and pepper to taste.